Established in 1998, r.t.goods. Is proud to begin the introduction of a new and diverse range of App related products. These are forward thinking in approach and are designed to improve the well being in many areas of your daily life. Go to the App Store on Your phone and download it Now! My Business Expenses Manager is an intuitive, user friendly mobile app for iOS and Android, also, It's possibly the best 'Business Manager App' on the market today! For a relatively low priced App, it certainly punches above its weight with the amount of built-in functionality it has. Pretty good for the price of a coffee and a biscuit. Once the relevant setup information such as your country, your name, opening mileage - if applicable. (if not enter 0 zero) Tax rate and Mileage charge - if applicable (if not enter 0 zero) is saved in SETTINGS, you simply tap the NEW tab and you're ready to go. This takes about - 45 seconds! My business Expenses Manager, really does what it says on the tin and enables business men and women to control, manage and record all the daily Business Expenses incurred in today's busy environment, in a simple, easy to use format that will make their life easier. It really is the perfect partner for all business people on the go. So what it does it do for you? Mileage that's charged for at the rate set by you. Total Mileage for expense period. Provides running costs per vehicle. Registration / Licence plate ID for use in different vehicles. Value Added Tax VAT - Europe. State or Local Tax rates edit facility, for USA and other Countries throughout the world. Built in multi currency compatibility. Create real time expense reports. 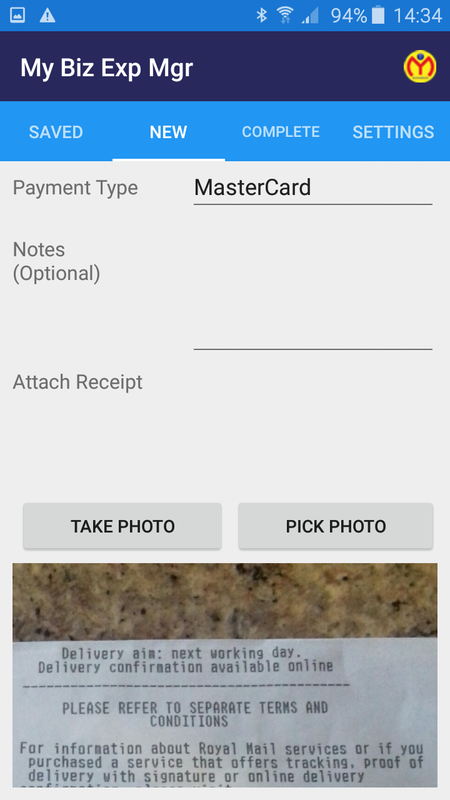 Easy receipt capture, allows you to take photos of receipts, confirms details and auto-links them to appropriate expenses details. Lists multiple payment methods and credit card choices (editable). Easily reconcile credit card transactions. 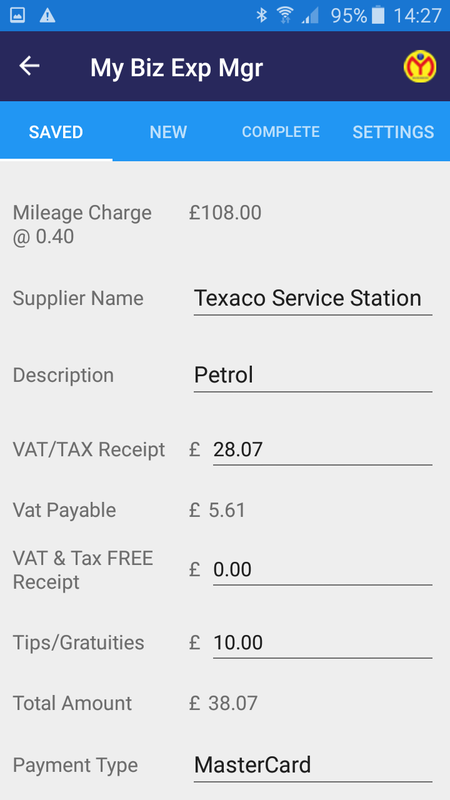 Notes section allows you to add more information about the expense, if required. All expenses are stored in a saved folder where they can be checked and edited prior to completion and export. Completed expense can be either bulk exported, or sent individually. Reports 1. Export as a .pdf with 'date linked' photo receipts attached for ease of printing. Reports 2. Export as a csv file with no photo receipts, this enables accounts dept easy spreadsheet integration. 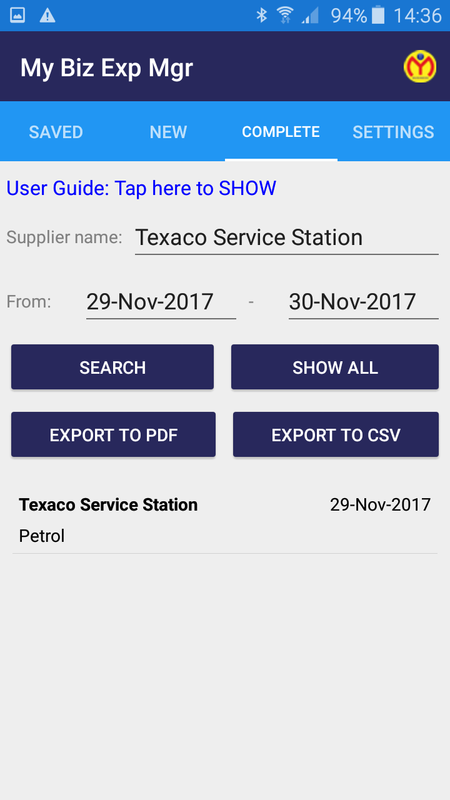 Search and export expenses by date, or by supplier name. Use Date fields to export expense data within a given calendar range. Backup and restore data settings for easy integration with new upgrades. Bulk erase of 'sent' data after confirmed export in both .pdf/csv format. Create a list of your suppliers or contact names. Create a description list of services from any supplier or service provider. 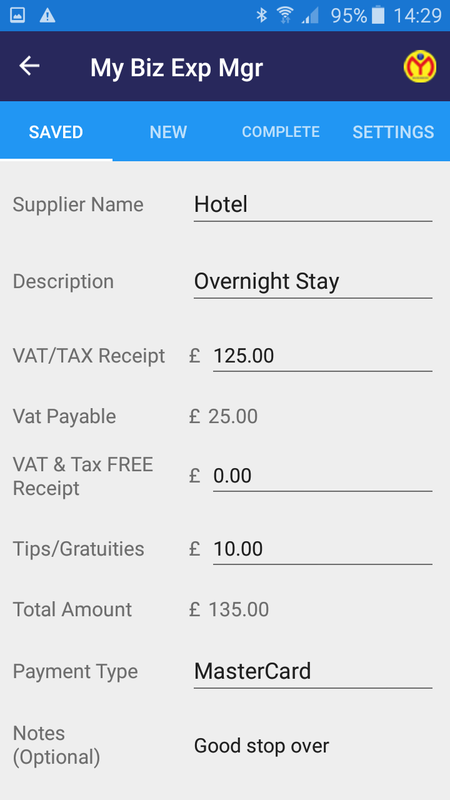 The 'notes' section allows you to add a brief description of a meeting or details of service from a supplier etc. The built in User Guide at the top of each screen will guide you through any questions that you may have. For security reasons, the only bit of personal information saved within the App is your name, so if you unfortunately lose your phone, no one has access to credit card details etc, (unless they are stored elsewhere on your phone). So, If you want to get ahead - Get 'THE' App. You know it makes sense! No part of this site can be copied without the express permission of r.t.goods, © Copyrighted 1998 - 2018.